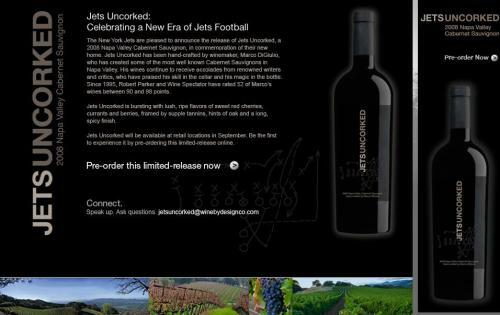 The New York Jets organization is celebrating a new era of football by selling a limited release commemorative win on their team website called Jets Uncorked. The wine, a 2008 Napa Valley Cabernet Sauvignon, was created to help fans celebrate the team's new home, the New Meadowlands Stadium in East Rutherford, NJ. The Jets Uncorked wine is available for purchase online for $27.99 and will be available at select retail locations in the local marketplace beginning in September. The team opted to make 8,000 cases of the wine after touring several wineries in Napa Valley and settling veteran winemaker Marco DiGuilio and lifestyle marketing agency Wine by Design to create the concept. Per an article in the Huffington Post, NFL organizations are allowed to work with a wine manufacturer to produce limited edition promotional packaging to commemorate significant events. The initiative serves as a great way for organizations to honor select occasions like stadium grand openings, free agent signings, Championship victories, Hall of Fame inductees, and longstanding fan loyalty. As more organizations align look to bring on Official Wine Partners, expect to see similar tactics come to fruition in sports business.